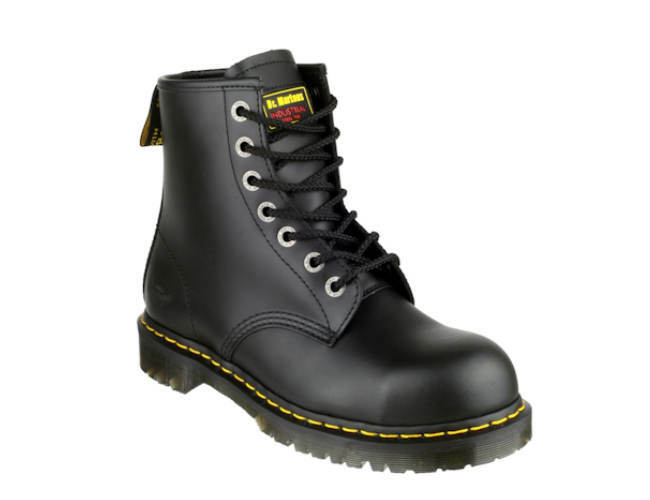 dr Marten Safety Boots |Black Fine Original. The original dr marten safety boots still going strong. The boot comes with a high cut safety steel toe cap, is rugged and designed and made with industrial grade 1 leather uppers. It is moisture wicking with special heat sealed linings unique to the company. It also has the famous commando sole unit. Make no mistake this is a top quality safety boot. Abrasion resistant polyester material blend wicking lining keeps for dryness. Removable cushioned foot bed with antimicrobial properties.Breathable comfort with odour control. Air-cushioned commando sole. Welted design and construction. UK 3 – 13 whole sizes. All safety standards exceed the British standards.